Open Educational Resources (OERs) are freely-accessible teaching, educational, and research materials that either exist in the public domain or are available to users via an intellectual property license that permits their free use and re-purposing. These resources include complete online courses, course materials, modules, textbooks, streaming videos, tests, assessment tools, and software. They provide people worldwide with access to quality education and the opportunity to share, use, and reuse knowledge. Choose a standard textbook, put a physical copy on reserve, then let your students know how to access it. Choose a textbook or articles where the library already offers free digital access. Place the item on ‘e-reserve‘ and then link to the item on your Blackboard site or include a link in your syllabus. Choose an existing Open Educational Resource (see Finding OERs below). Work with us to develop and publish an OER for your course(s). Contact Aaron McCollough at amccollo at gmu.edu to get started. In conjunction with Deep Web Technologies, University Libraries has developed a search engine that simultaneously queries a number of open educational resource sites. 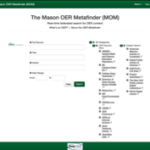 Used by more than 290+ universities, colleges and organizations, the Mason OER Metafinder searches well-known OER repositories like OpenStax or Merlot II, but also searches HathiTrust, DPLA, Internet Archive and other sites where valuable but often overlooked open educational materials may be found. We’re still adding search targets but today our OER Metafinder searches eighteen sites in real time, returning the top 100 or so hits from each site–in seconds! Additional matches continue to trickle in as you begin examining your results.